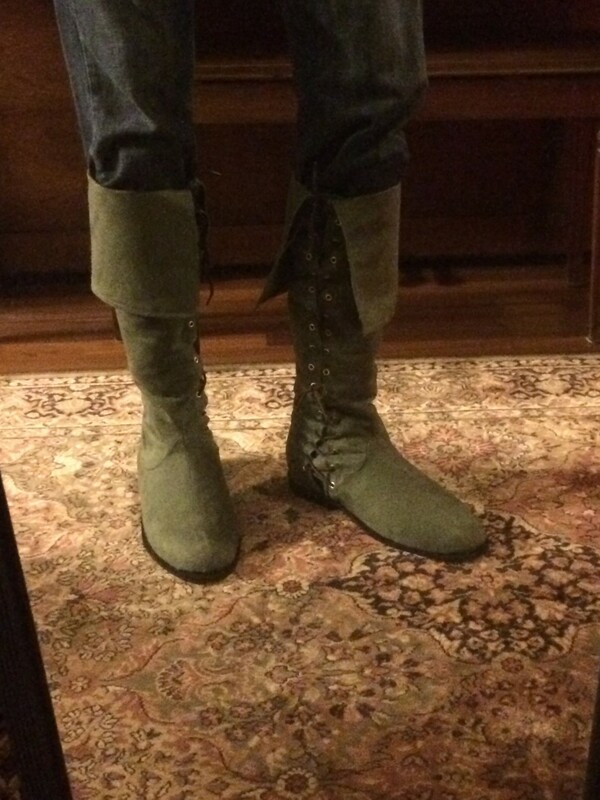 I’m working on a Robin Hood costume from Doctor Who, and I’m starting with the boots. 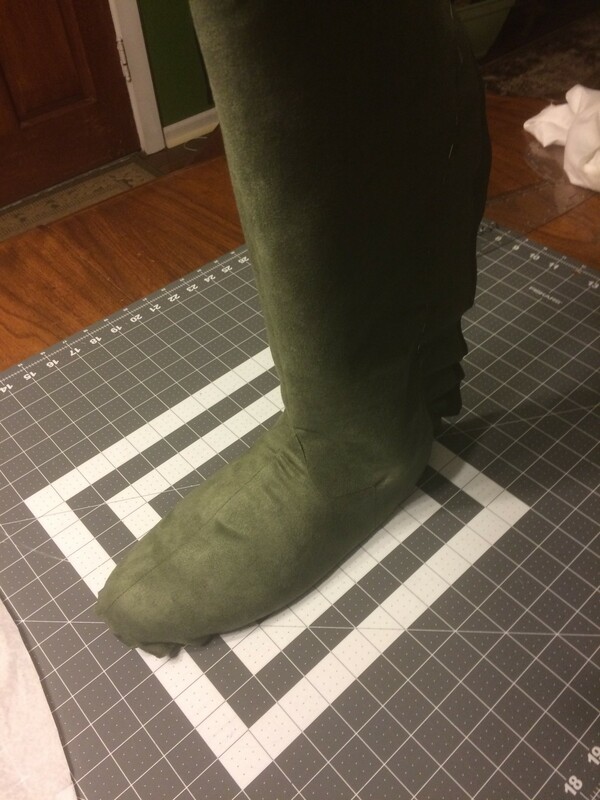 I made Caspian’s boots using a similar method (following this deviantart pattern), but I’m documenting these a bit better, and refining my technique. The first thing I needed to modify was to beef-up the structure and shape of the uppers, so I’m using thicker (5mm) craft foam. I’m cutting the foam shapes using the same exact pattern I will eventually use for the fabric cover, but without seam allowances. 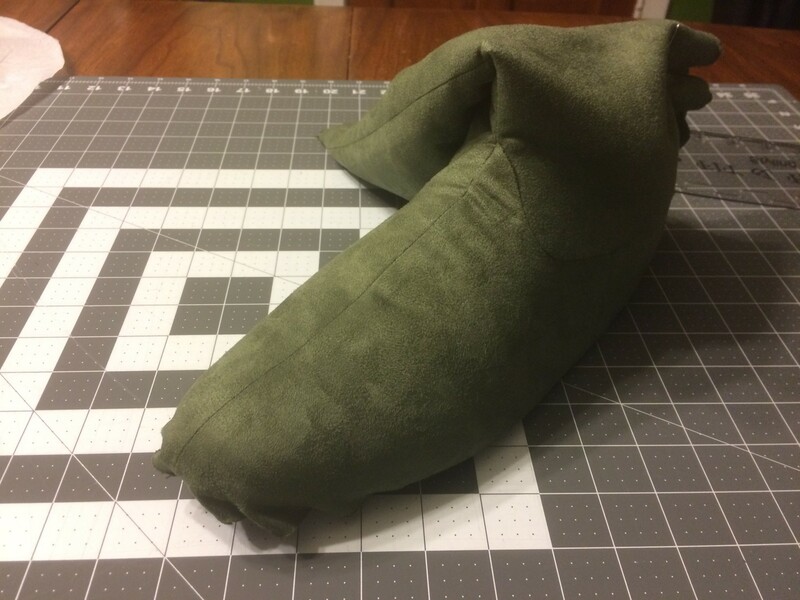 I am also not using foam for the part that will go up the legs – I’m using upholstery fabric, and it’s stiff enough to hold it’s shape, especially being snug against my legs. 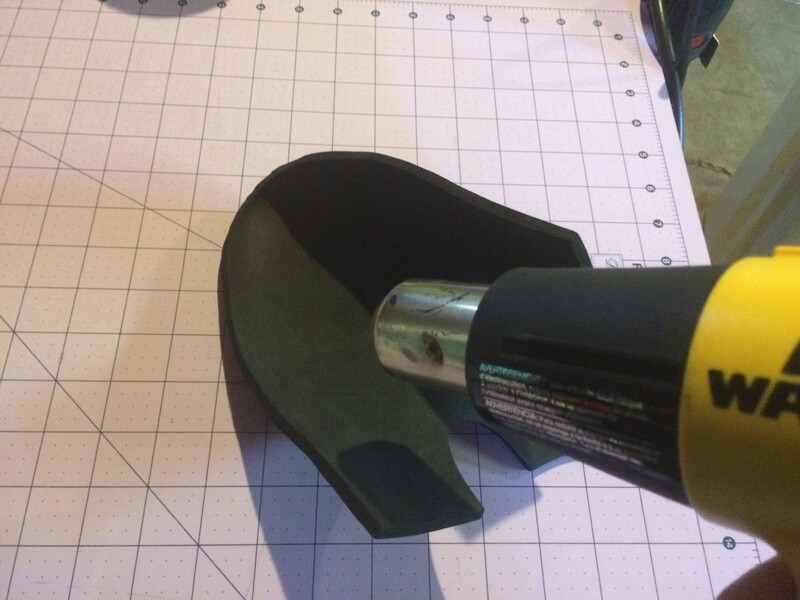 First I cut out and shaped the foam with a heat gun. Something else I’m doing differently is shaping the foam over some wooden lasts I picked up at a thrift store. They are not my size, but they help give a better-defined shape to the foam. 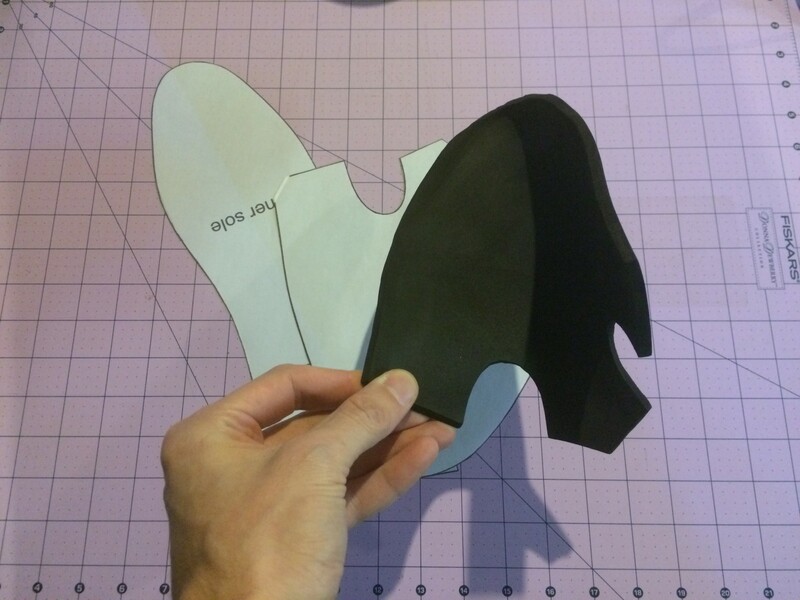 For the heel sections I molded the foam around a hard street-hockey ball. 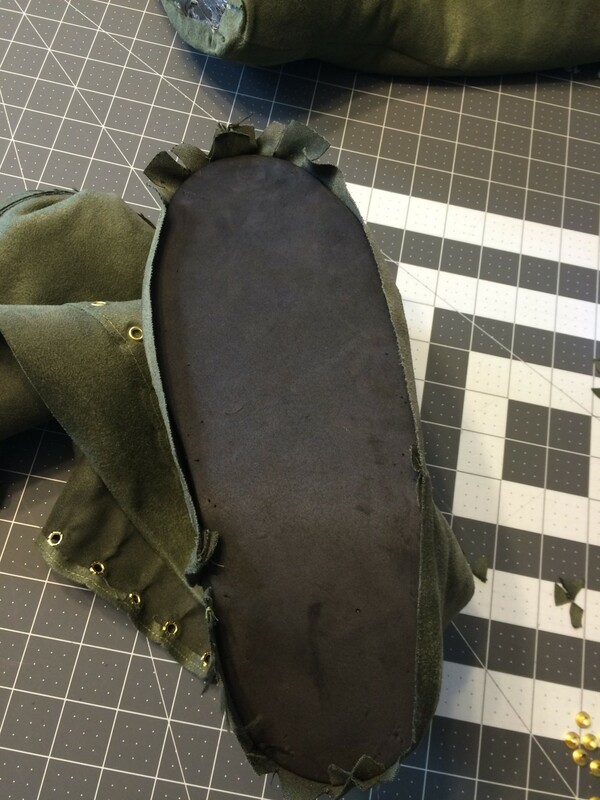 I used Barge contact cement to attach the upper foam pieces to the soles. I hot-glued my previous pair and it held up fine, but Barge gives me a cleaner seam. 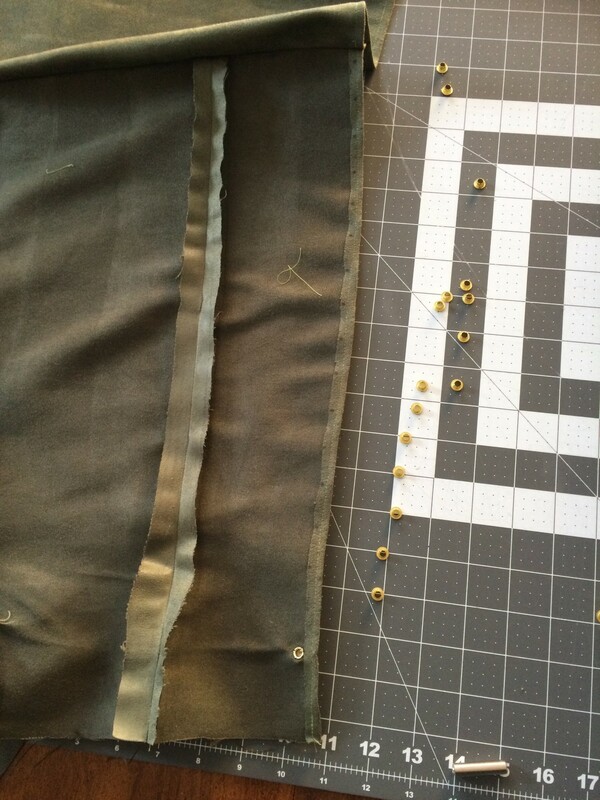 When cutting out the cover material, I added 1/2-inch seam allowances on all sides. On Caspian’s boots I didn’t sew proper seams (right side to right side), but rather stitched the toe portion (vamp) on top of the side pieces(wrong side to right side), leaving a raw edge. This was because the pattern had a lot of wiggle room built into it at these seams. 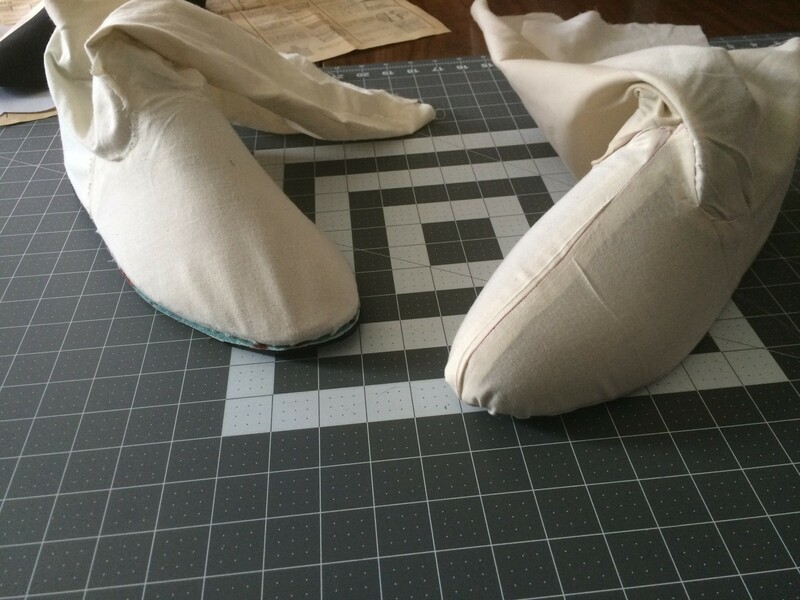 For this pair, I wanted the seams to be a little more clean, so I began modifying the shape of the vamp. This involved a lot of mockups and seam-ripping until I ended up with something I was happy with. In the gallery below, you can see the old Caspian mockup on the left, and the Robin Hood mockup on the right. I added a top-center seam on Robin Hood because I see one in reference photos, and it makes sewing the complex-curve slightly easier. 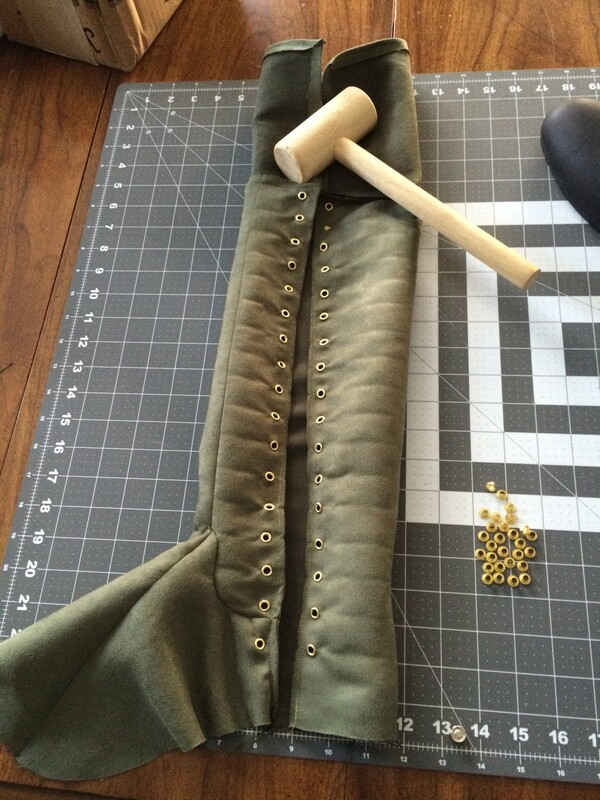 Once the pattern pieces were sewn together, I stretched them over and pinned them to the foam. 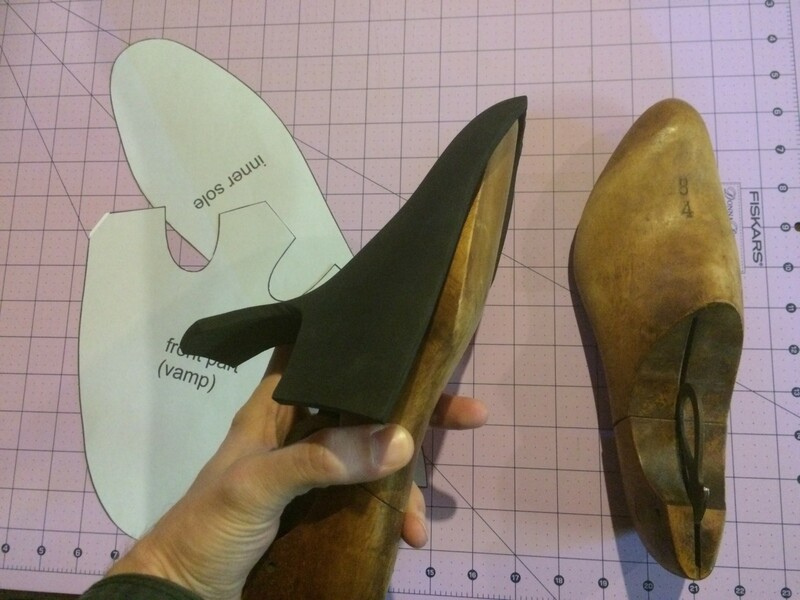 This is a non-permanent way to check the fit, and it’s analogous to the method shoemakers use to tack the leather into place over the lasts. 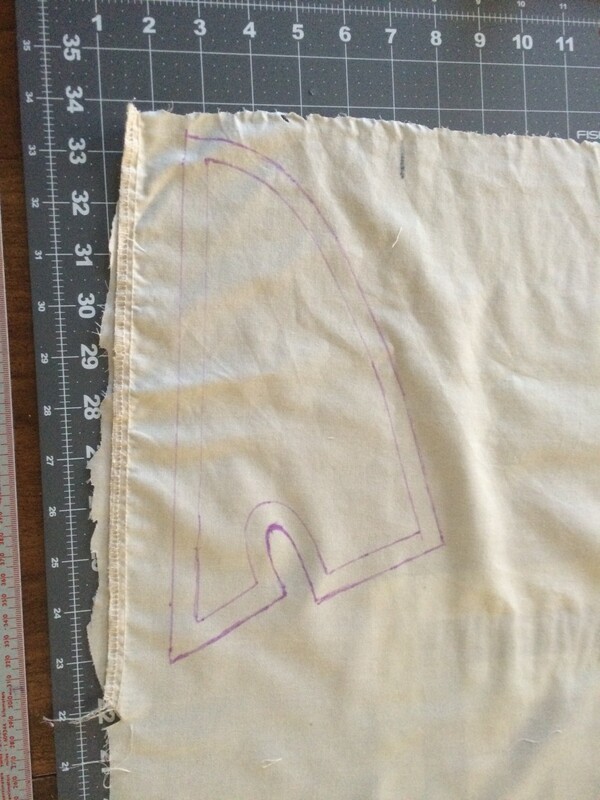 On the final fabric I’ll cut triangles into the seam allowance on the bottom to get rid of the puckering. Old and busted on the left, new hotness on the right. On this mockup, I have not yet established the seam up the back. 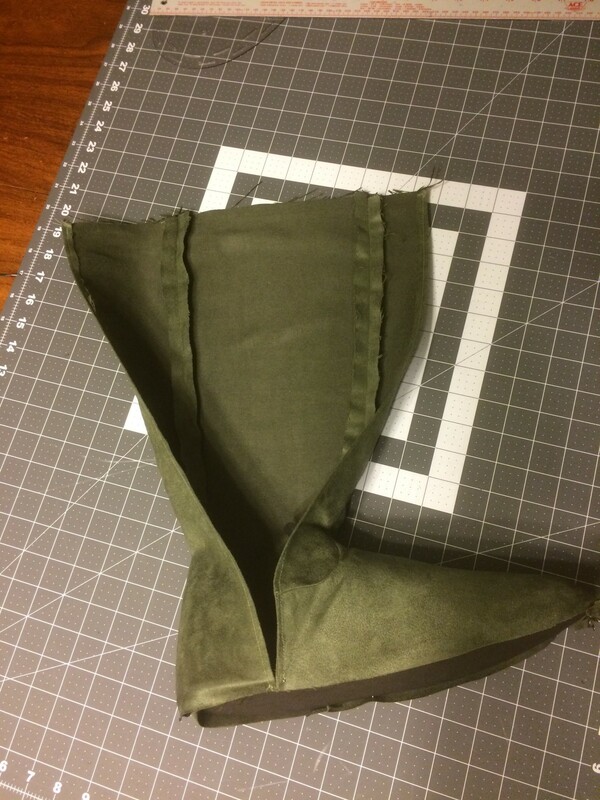 Since these boots need to lace up the side, I will need to leave about 1/2″-1″ extra on one side so I can cut it open and finish the edges. 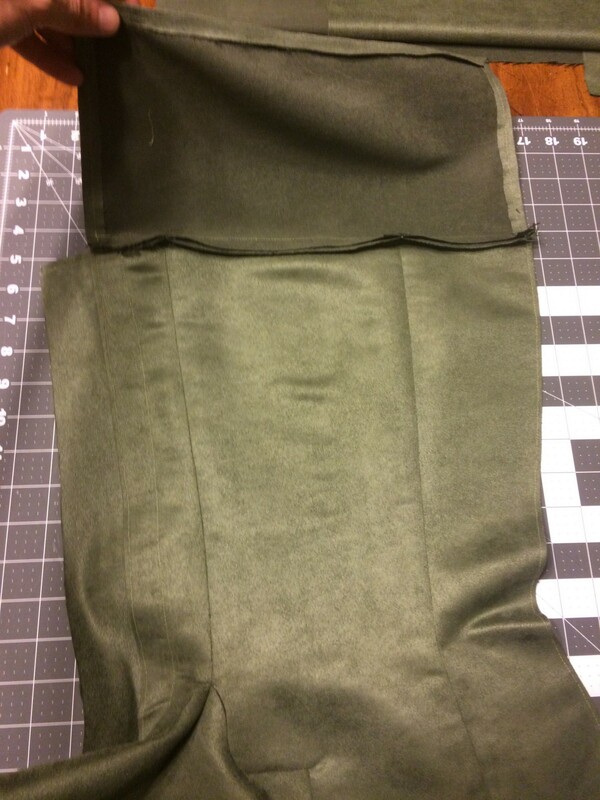 Instead of figuring that out in the mockup, I got excited and jumped straight to the final fabric, polyester suede upholstery fabric from Jo-Ann. I bought 1 yard, and had a little left-over. 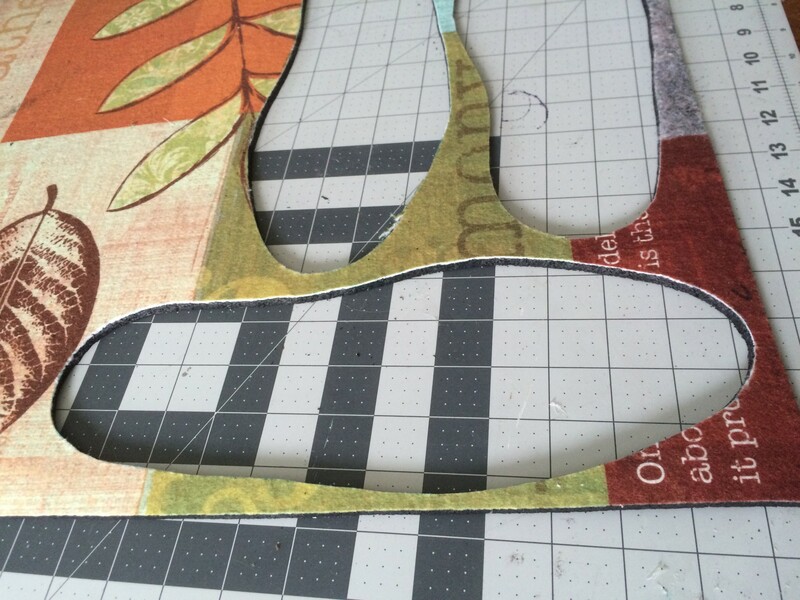 When sewing the pattern pieces, it’s very important to clip your corners and curves. 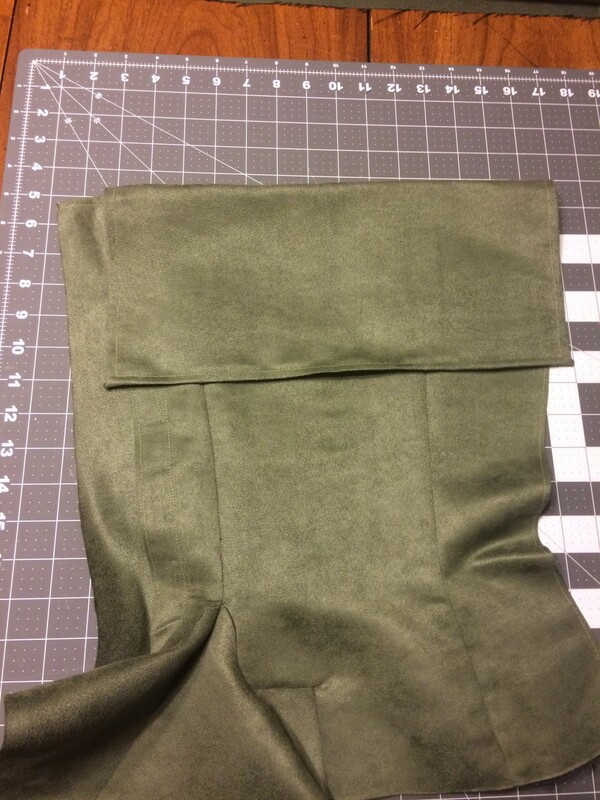 After sewing them together, I pressed all my seams open. 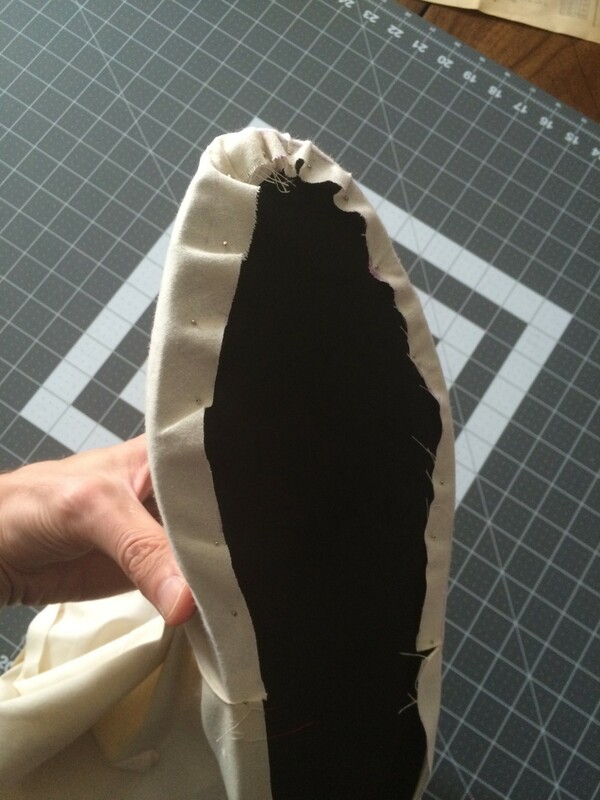 This is important for the fabric to lie correctly on top of the foam. 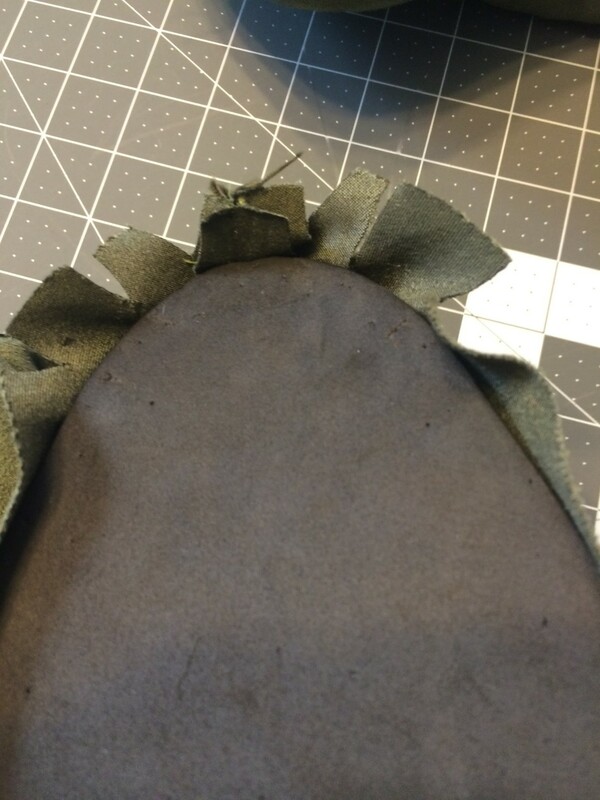 I once again pinned the fabric to the foam, and established where the back seam would go, keeping in mind the need for some slack on the instep side. Then I removed it from the foam, used a ruler to draw a straight line up the side, and cut it apart. 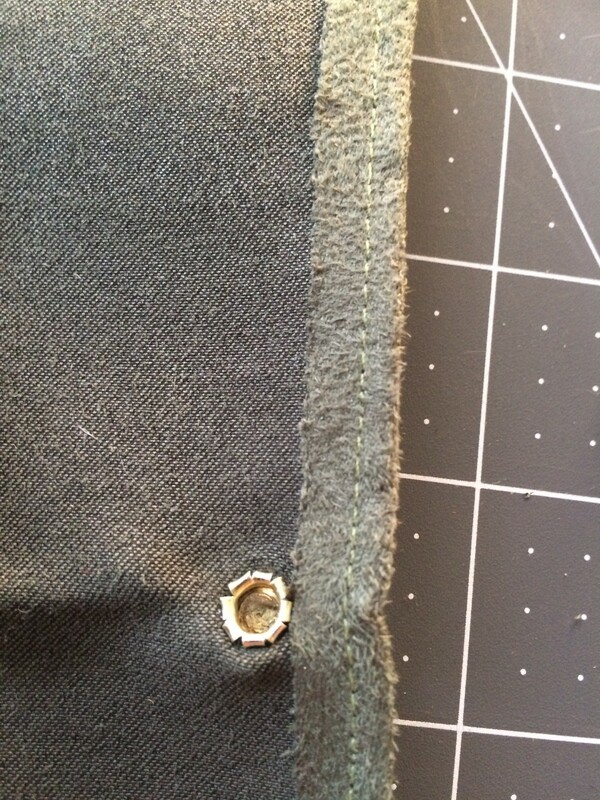 The opening ends up being right along the vertical seam where the vamp meets the side piece. 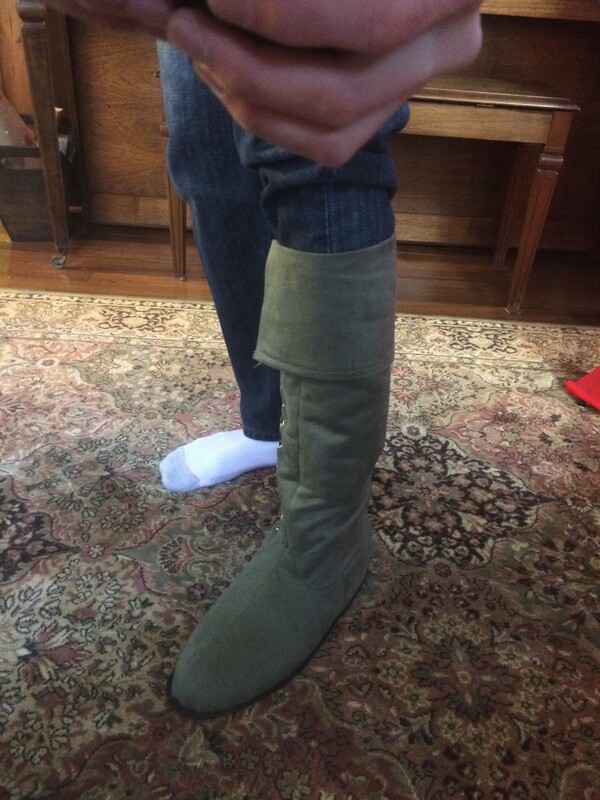 I should have been doing both boots simultaneously or don one mockup as a pattern. 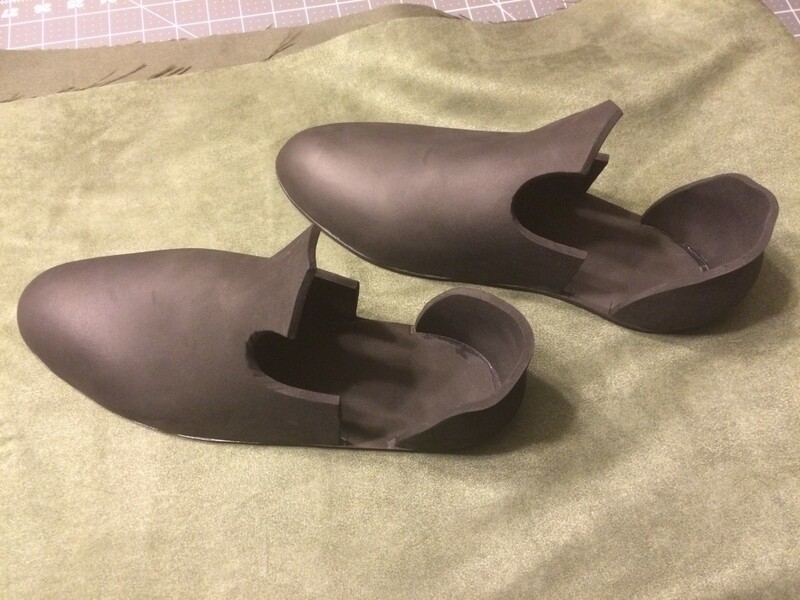 Instead, I’ll need to reference the nearly-finished left boot cover when I make the right one. 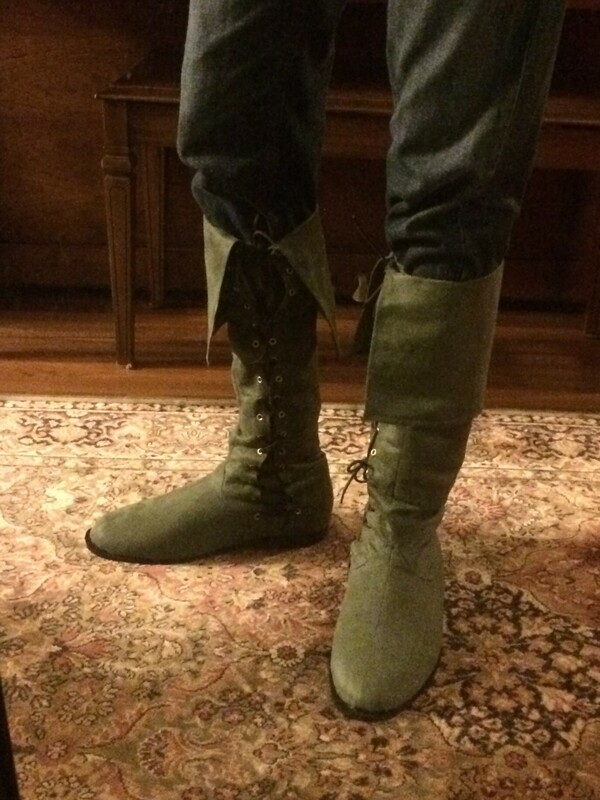 Once I had gotten both boots to this point, I added a cuff by sewing a piece to the top of the boots “right” side to “wrong” side, so that when it flips down the right side is showing. 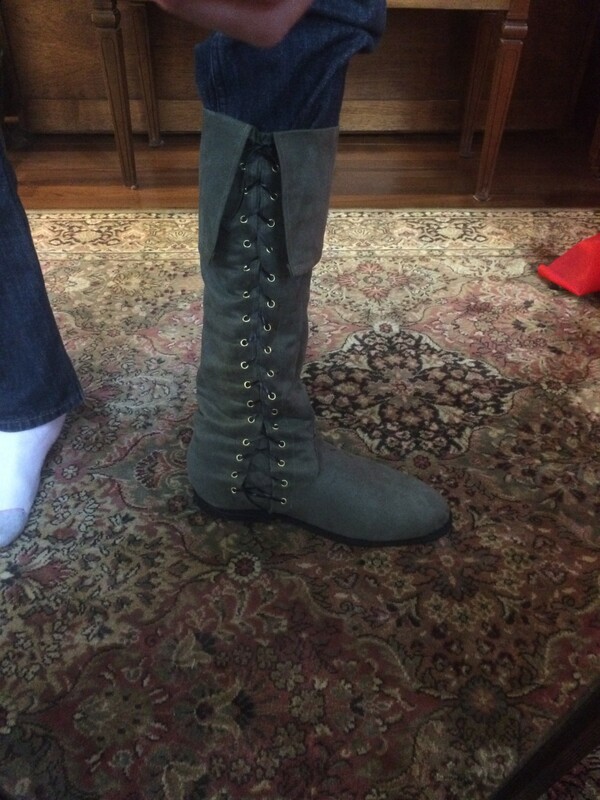 I also sewed-in a backing piece that will go behind the laces like a fly on a pair of jeans. 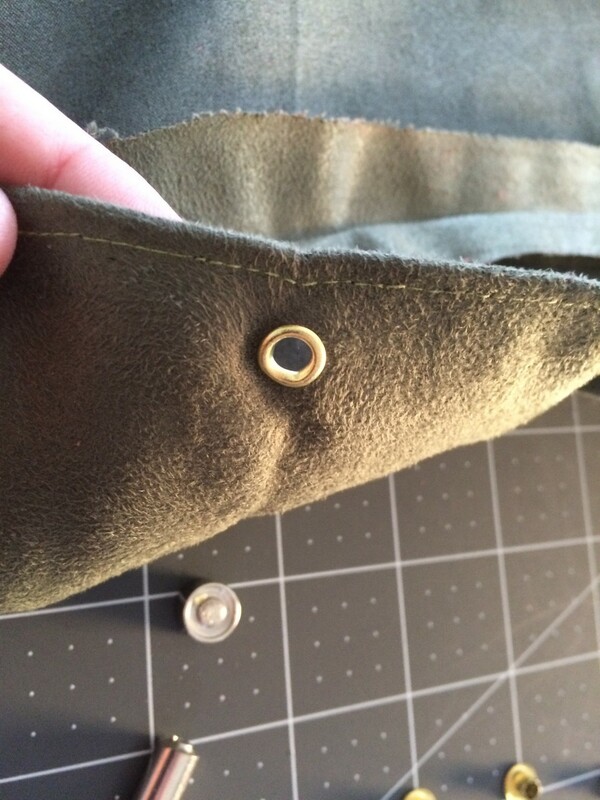 Then I added a brass eyelet every inch, about 1/2-inch from the edge on both sides of the opening. 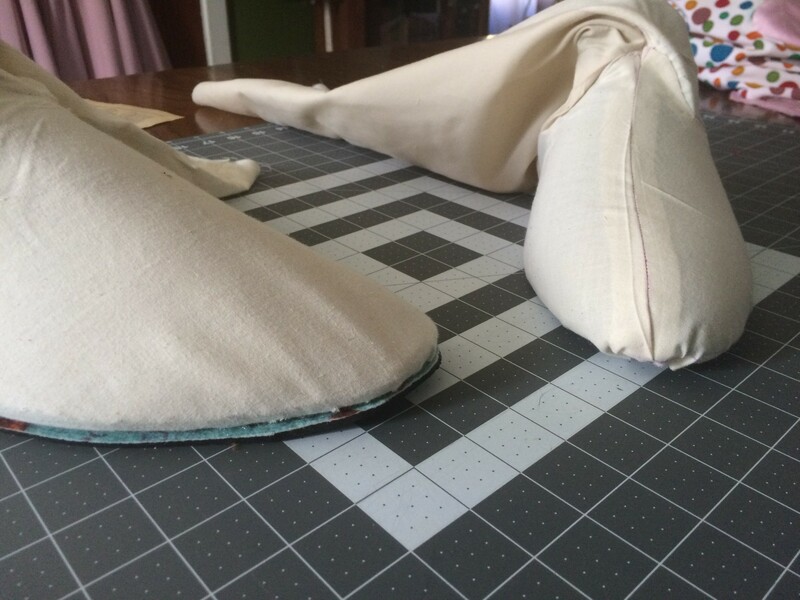 Now that everything was ready, I again stretched and pinned the covers to the foam forms. This time I clipped into the curves where the fabric overhung, then used hot glue to permanently attach the fabric to the foam. 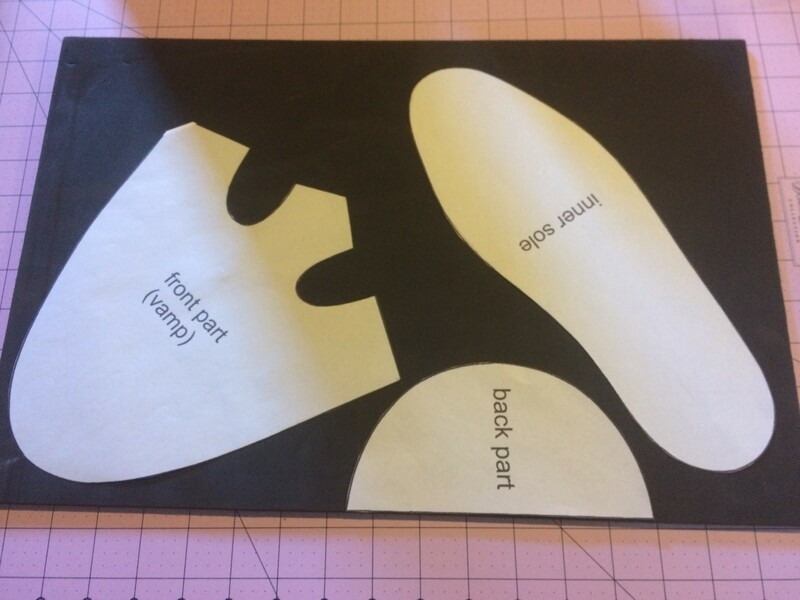 To finish, I used the same method I used on Caspian – I cut out soles from a rubber welcome mat, and added two layers of the same mat for heels. These were all glued on with Barge. Conclusion: I see a couple places I can improve for next time, but these were a step forward from my last pair, and better than ANYTHING I could have gotten commercially for a reasonable price. They only cost me about $25 in materials, and a couple nights of work.